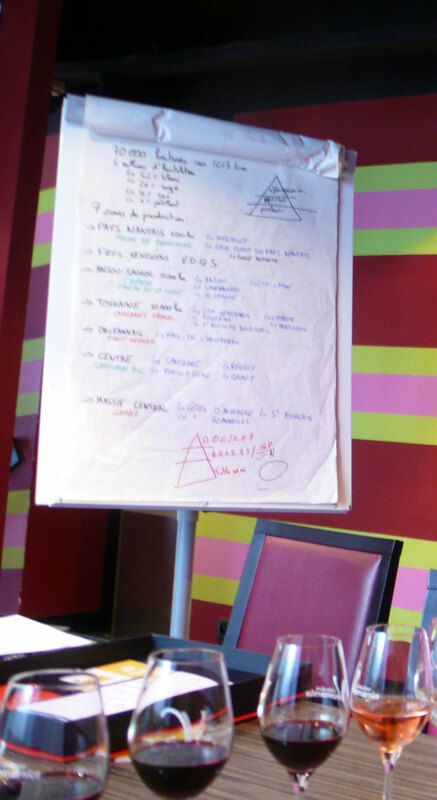 I just sat down to write up my impressions of our recent wine tasting with Femme Francophile at Vinomania in Blois but, surprise, surprise, I’ve left my notepad at Closerie Falaiseau, and I don’t know how much I can rely on my memory to relate the details of a 3-hour session! But I’ll try anyway and then write another post when I get my notepad back. Virginie, the sommelier, has various wine tasting themes to offer, but I chose one that links the history of the Loire Valley with the local wine production. Now, wine from the Loire Valley is not held in much esteem in France. Most people favour bordeaux and burgundies for red and Alsatian wines (particularly rieslings) and chardonnay for white, although sancerre does have a small following. There is actually an historical reason for this, but that’s one of the things I can’t remember! The Loire vineyard is 1013 kilometres long and covers 70,000 hectares. That’s about 170,000 acres. 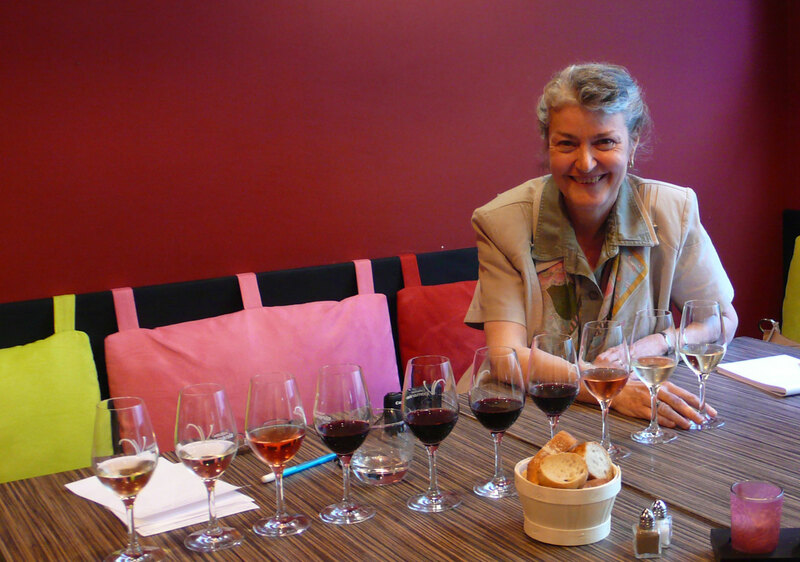 And they produce every type of wine: white (52%), red (25%), rosé (16%) and natural sparkling (6%). The grape varieties (or cépages as they’re called in French) are numerous but the names are often different from those used in other parts of France. Melon de Bourgogne (brought over from Burgundy by monks in the 17th century), chenin (also called pineau de la Loire), sauvignon (which sancerre is made of), chardonnay (also called auvergnat), pinot gris (alias malvaise), chasselas and romorantin are the main whites – already quite a large collection. The reds are cabernet franc (known as bréton because it originally came from Nantes), gamay, pinot noir, cabernet sauvignon, grolleau (sometimes grollot), pinot d’aunis and cot (alias malbec). You may recognise cabernet franc and cabernet sauvignon from Bordeaux among those (the other variety down that way is merlot) and pinot noir and chardonnay from Burgundy. But that’s where any ressemblance stops. The main production areas are Nantes, Anjou-Saumur, Touraine and the Centre. The most well-known appellations (that’s how they categorise wine in France) are probably chinon, bourgueil, saint nicolas de bourgueil, saumur and saumur-champigny for reds, sancerre, as I mentioned, for whites, and vouvray, which is a sparkling wine. If you don’t live in France, you’ve probably never heard of most of them. So with all those different grapes (which can be blended of course! ), how do you find your way around? Each grape variety has a range of “noses” to choose from. For whites (and these are probably the easiest to detect), the main ones are “white blossoms” such as hawthorn and apple blossoms, briar roses and roses, citrus fruits, grilled almonds and hazelnuts, pears, pineapple, lychees, apricots, toast, honey and butter. Sounds like breakfast, doesn’t it? But fresh butter is the very distinctive smell of a French chardonnay from Burgundy. The list isn’t really that long and with a bit of training, you can learn to detect most of those, particularly if you practise with those little phials I told you about in a previous post. Our perception of smell is very personal so, as Virginie insisted, there’s no “right” or “wrong”. The reds offer a lot more variety as far as “noses” go, but on the whole, you can look for berries such as red and black currants, blackberries and raspberries and dark stone fruit such as prunes and cherries. Some of the stronger reds might conjure up mushrooms, cedar, pepper, leather and musk. A smell of vanilla is a typical sign of oak. In the Loire in particular, green capsicum (bell pepper) is a sure indication of cabernet franc or cabernet sauvignon, particularly when they’re young. So knowing what to expect can be very helpful when you first begin wine tasting. Next time, we’ll get down to the nitty gritty! This entry was posted in France, Loire Valley, Uncategorized, Wine and tagged cépages, Loire Valley, sancerre, Vinomania, wine tasting. Bookmark the permalink. Hi, Mary Kay from Out and About in Paris recommended your blog to me recently – I’m a Kiwi living in the Loire Valley (Tours), so I look forward to reading more about your experiences here (and in Paris). I love wine too, mostly from the amateur perspective, but I try to do dégustations when I can, and I always drink local! I’m not sure why Loire wines don’t have a better reputation… I drink mainly rosés, which are already looked down on a bit, but Chinon rosés are delish! Hi Gwan and welcome to my blog. And thank you to Mary Kay whom I saw this afternoon. You must also join the Loire Connexion, an ever-expanding group of English speakers in the Loire run by Summer Jeaunaud. If you’re on Facebook become my friend https://www.facebook.com/AussieFrance and I’ll invite you to join the community. A belated thank you for your notes and comments on wine of the Loire which I have copied off for our upcoming week in the area. There is nothing more perplexing than standing in front of rows of unknown grape types and wine labels. Where does one start!! That said, we’ve always seem to find someone willing to talk to us about wine and we are generally offered good advice. Your notes will give us a head start. Thank you. You’re very welcome Themoof (now that’s an interesting pseudo!). Hope you find lots of wonderful wine while you’re here!